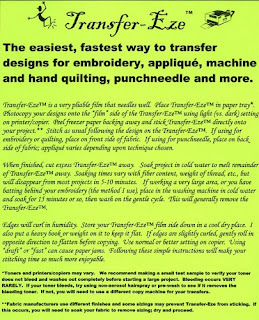 Quilting Adventures: Transfer-eze a recent issue! 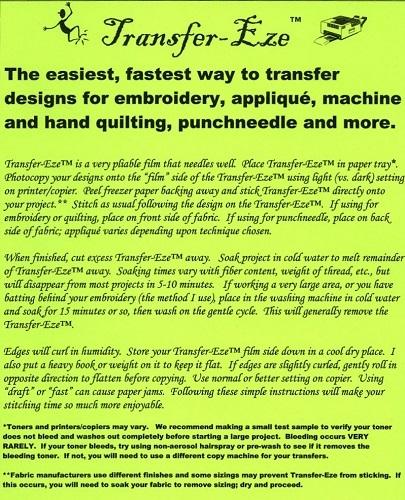 Do any or you use Transfer-eze? I'd like to talk about a recent issue that was brought to my attention from one of Fibre's customers. 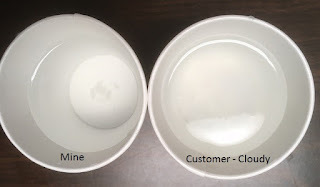 A few weeks ago, the customer called me to enquirer as to what she was doing wrong; the product would not dissolve. I explained to her how I processed my work and insured her that it "should" all come off. A few days later she stops by Fibre Junction and brought her work with her to show me. This is what it looked like with soaking and re-soaking etc. Notice the white area? That's the remnant of Transfer-eze. Here is the same picture where I added a filter so that you can see the film. 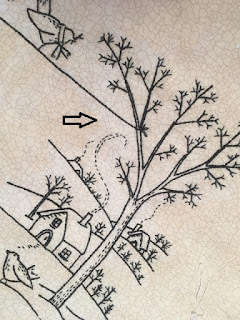 She also brought another piece that she had completed (she actually cut the extra Transfer-eze to avoid the same issue as the first piece) and wanted me to dissolve it for her to see if she was doing something wrong. I could not get the product to totally dissolve! I felt horrible for the customer. In all the years that I have been using this product, I have never had an issue. I apologized profusely, refunded her for the defective package of Transfer-eze and sent her home with Sticky Fabri-Solvy from Sulky. On January 13, 2017, I proceeded to do a little experiment to see what the heck was going on. I wanted to understand the issue that prevented the product from totally dissolving. I dissolved a piece of Tranfer-eze from my package (I buy this product in packages of 30 sheets) in one cup and a piece from the customer's package in the other. 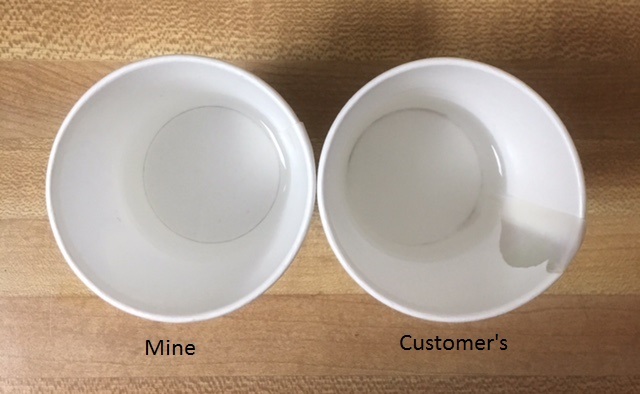 The left cup is clear with a bits of sediment on the bottom. Notice how cloudy the right cut is? Now check this out! I could actually pick up goo with my finger. Holy smokes! I kept the cups, as is, sitting on my back counter to see how long it would take for the Transfer-eze to dissolve. As of today, here is a photo of the same cups. The product has dissolved, no goo is left. The water on the right is a tad slimy. I quickly phoned my customer to let her know of my findings. I have been in contact with the company that markets Transfer-eze and have let them know of my findings. As of yet, I have not received a reply. SHOULD you ever have the same issue with this product, let your fabric soak for at least a week. I would include a daily change of water. Let's hope that this is an anomaly, I like using Transfer-eze! I am not sure if I have any of that, I have a lot of different types. Usually I do wall quilts so a little stiffness won't hurt it. Hmm, I wonder at the difference. Maybe it was a bad batch. I have never had a problem using it.